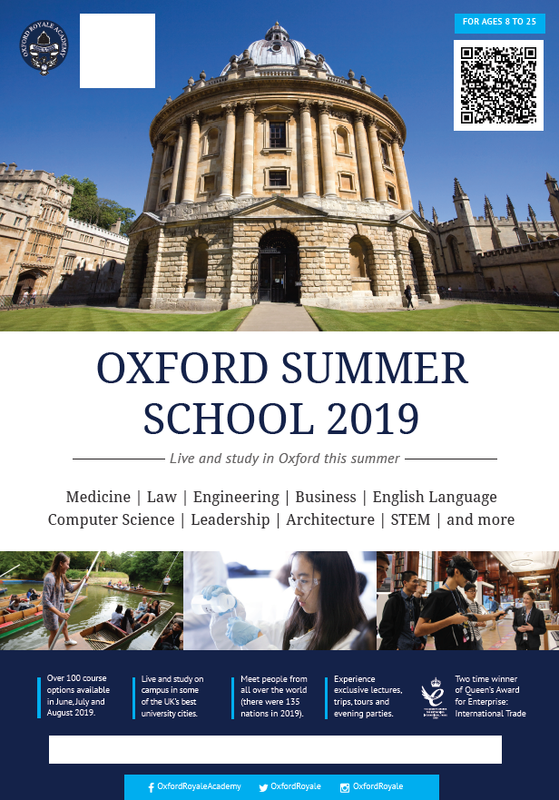 The Oxford and Cambridge Advanced Studies Programme is a prestigious academic summer course for high-school students ages 16-19. It is a unique opportunity for high-achieving students to live, study and socialise in beautiful Oxford and Cambridge University Colleges. Students travel to Oxford (OASP) and Cambridge (CASP) from all over the world. Oxford Brasenose College enjoys the best location of any Oxford University College with the entrance to the Old Quad on Radcliffe Square next to the Bodleian Library. Brasenose College was founded in 1509 and over the years it has been home to many famous students from author William Golding to the ex-British Prime Minister, David Cameron. Each student has a comfortable single bedroom. The Frewin Court annex is situated next to the historic Oxford Union, the world-famous student-debating club. In addition to student rooms, there is a pleasant common room area with a TV and games for evening leisure time. The Cambridge Advanced Studies Program (CASP) is located in Magdalene College, which was founded in 1428 and is the seventh oldest Cambridge University College. Located just north of the city centre on the River Cam, it enjoys the longest riverfront of any college. Magdalene is famous for housing the diaries of Samuel Pepys, the writer who recorded the events of the Great Fire of London in 1666. Older, more traditional Magdalene buildings, such as the famous Pepys Library, are complemented by the modern Cripps Court accommodation and teaching block. Student bedrooms, teaching rooms and the dining hall are all located in the main college buildings. CASP students all have single rooms. Wi-Fi is available across the campus. It is also a very short walk to the historic centre of Cambridge and the many attractions, shops and cafes on offer to students. This programme includes academic study, adventure training, creative arts, sport, confidence and team building as well as recreation, and is designed for 8- 6-year-old students. Founded in 1934 by Dr. Kurt Hahn, the originator of the ‘Outward Bound’ philosophy of education, Gordonstoun School is one of the most famous boarding schools in the U.K. The School has among its past pupils five members of the British Royal family together with boys and girls from other royal families from around the world. Great importance is attached to international understanding with a quarter of the School’s pupils coming from overseas. Offers Summer courses from ages 13-18 ranging from subjects and a variety of sub-programmes such as law, enterprise, leadership, medicine, engineering, film, computer science, mathematics, and much more. Our Broadening Horizons course offers students aged 16-18 the opportunity to live and study in a college of the University of Oxford or Yarnton Manor. Students choose three subjects from the 23 options available, allowing them to pursue areas of interest or to try out something new. Attendees on the Broadening Horizons programme receive more than 20 hours of tuition per week. Students select two unique morning options (one from List A and one from List B) and an Afternoon Workshop class. Students follow all of their classes for two weeks – attendees on the four-week programme are asked to select two options from each list. A residential summer school based in Cambridge for 14-18-year-olds. The program includes a combination of academic courses with a university preparation program, which includes evening lectures, workshops on life skills and mentoring from a team of supervisors. Outside the classroom, students take part in a wide range of daily activities, as well as excursions to places of cultural and historical significance in England. This programme is designed for students aged 13-18, and combines learning, creative enrichment and action. Provides Pre-IB courses for prospective IB students, Mid-IB courses as well as IB revision. The King’s College London Pre-University Summer School is open to high-school students (16-18 years), and combines on and off campus study, alongside a programme of social events and activities. There is a residential and non-residential option. Students on the full residential programme will stay in College accommodation and take part in all activities and trips throughout the programme (including the residential weekend). Students on the non-residential programme will attend classes during weekdays only (typically 10:00 – 17:00). Location: Accommodation is guaranteed at the College’s Stamford Street Apartments which is located in the heart of Waterloo, within short walking distance to our Strand and Waterloo campuses where Pre-University teaching takes place. It is minutes away from London’s top attractions, including the London Eye, the Houses of Parliament, Covent Garden and the South Bank cultural centre. Has one or more abilities developed to a level significantly ahead of their year group (or with the potential to develop those abilities). Summer language, sports and activity programmes for various age groups. 2016 summer courses are 2, 3, 4 or 6 weeks long with two optional extra weeks and cater for students between 6 and 17 years old. All students have 15 hours of English tuition per week, with qualified teachers, in small classes with a maximum size of 12. All students attend three hours of English classes during the morning on Monday, Tuesday, Thursday, Friday and Saturday. Location: 4 campuses including Street in Somerset, Bruton, Glastonbury and Bath.